Quinoa is quickly becoming one of my favorites grains. 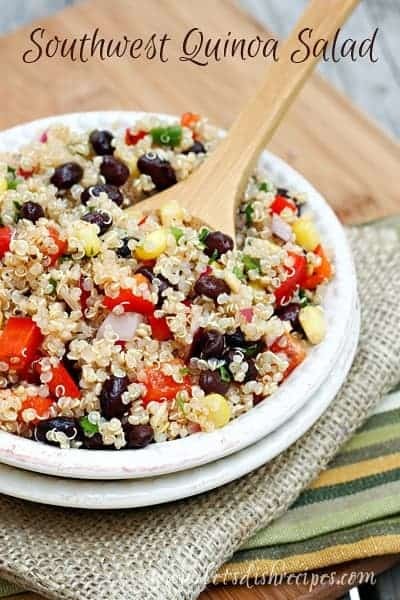 It’s just so versatile, especially as the base this nutritious, protein packed Southwest Quinoa Salad. After trying a Southwest quinoa salad from my local grocery store deli, I knew I could probably recreate it at home. This salad is flavorful, but not too spicy. You could always replace the jalapeno with some chopped green onions if you prefer and even milder version. I usually enjoy it as a quick, healthy lunch. It keeps for several days in the refrigerator. Combine the ingredients for the salad in a medium bowl and toss together. In a small bowl, whisk together the dressing ingredients. Pour over salad and mix well. 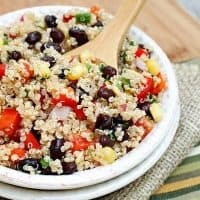 I’ve been looking for a good southwest quinoa recipe lately!! I’m excited to try this! I am so going to try this, love the recipe and dressing. Looks good! I’ll have to try this one day…. Looks great! I’ve made a similar dish – without the red pepper and using less spices but I want to try yours! yummy! I will have to make this the next time I have the girls over. There is no way my boys would eat this, but I could live off this kind of food. I made this for dinner tonight. It was fantastic- the right amount of flavor and heat. I only cooked 1 1/4 cups of quinoa because that is all I had I hand and I used the whole pepper. It seemed to be a good ratio of sauce:veggies:quinoa. A great recipe for summer! For some reason the recipe isn’t showing. I love making this salad and plan on making it for a baby shower tomorrow, but I can’t get the recipe to show up using both my phone and computer. Can you please help? Thanks! Your original recipe had red wine vinegar and I don’t see it any longer. Did you change that on purpose? It’s actually still there. I recently change my recipe card and the formatting messed up in some spots. I need to go in and fix it by hand, but the red wine vinegar is currently in all caps on the same line as the “dressing” header. 1/4 cup.